In comparison to other shipping vehicles, marine vessels are perhaps the most difficult to secure. Workers are at greater risk of falls and accidents because ships are in constant motion. Add changing tides to the equation, and providing safe access becomes even harder. Despite the challenges, improving marine safety offers significant benefits. Your workforce will be more surefooted on steady marine gangways with handrails, improving loading and unloading efficiency. Other forms of marine safety equipment, such as ship towers, make it easier to access vessels of any height. Barges and ships generally come to your facility for one of two reasons: to load or unload. 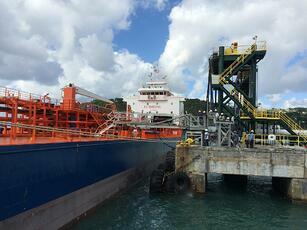 Docks are outfitted well for loading devices to attach to the ship. However, you have to figure out how to get on and off the vessel. This is the risky part because the docks are built for loading, not boarding. Equipment may be in your workers’ way, or varying ship configurations might make boarding difficult. Space may also be limited. Variations in water height mean your access equipment must be able to move over time while providing stability. If your dock is not the ideal configuration for getting on and off a vessel, you have the option to customize access equipment that works within a limited space or mitigates other obstacles. You must analyze your risk and exposure to accidents to determine how deeply you customize your safety solutions. If a worker at your site were to fall, the biggest risk would be falling into the water. The worker may get caught in a current, putting him in danger even with a life jacket on. Being pressed between the dock and ship is another risk. Workers also have to worry about falling into barges, especially those with open hatches carrying products like grain and coal. An expert can provide safety equipment sketches, specifications and plans. Or, you may simply have a conversation about what you hope to accomplish. You might have a general idea that you want to improve safety, but developing more specific goals will help you be more successful in implementing changes. To safeguard your site, it’s important to take proactive steps. Start asking questions about how safe your facility truly is and start researching your options. Don’t wait until an accident happens to analyze your marine safety risks. Improvements you make today may mean the difference between life and death for a valued member of your team. Are you ready to learn how to protect your workers and your budget? Discover three essential marine safety tips.